"Like a dog she jumped into the front seat right away and tried to climb into my lap." Derek Beam was on his way home from work — in bumper-to-bumper rush hour on the massive Washington D.C., beltway — when he spotted something pink running against the flow of traffic. 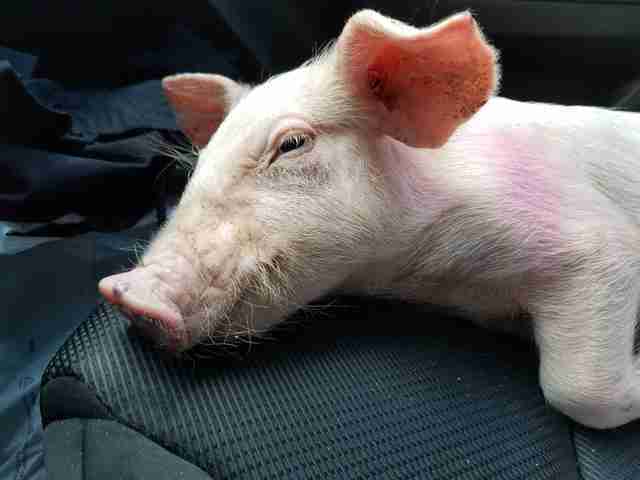 "Suddenly I see this tiny, TINY little piglet running down the lane divider," Beam told The Dodo. "I get out of my car and try to close in on the out-of-place animal without scaring it into the next lane." Another guy noticed what was happening and got out of his car too. With his help, Beam suddenly had a squealing pig in his arms. "I calmed her down, placed her in the back seat, and took off," Beam said. "Like a dog she jumped into the front seat right away and tried to climb into my lap." 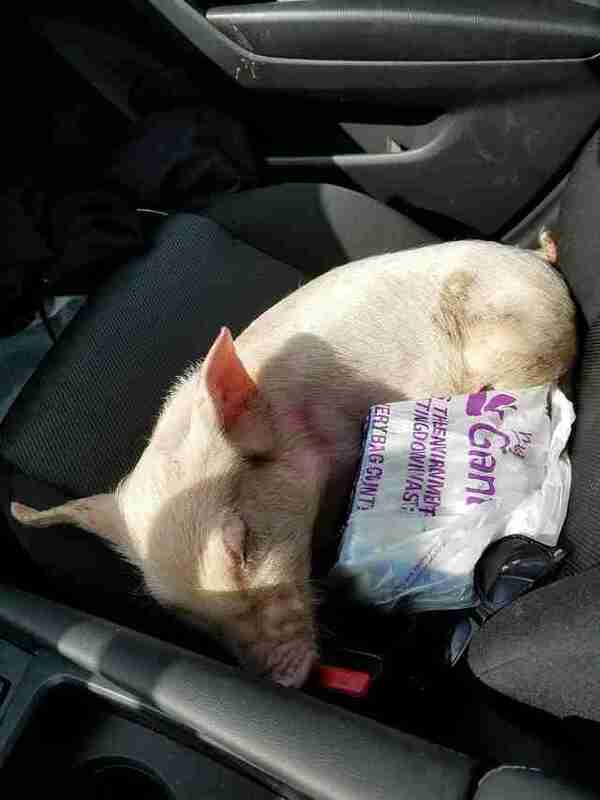 Beam managed to convince the piglet to settle for the passenger seat beside him, where she promptly fell asleep. "I kept an eye out for other runaways, or the truck she might have come from, but there was nothing," Beam said. And he had to figure out what to do, exactly, with a little runaway piglet. 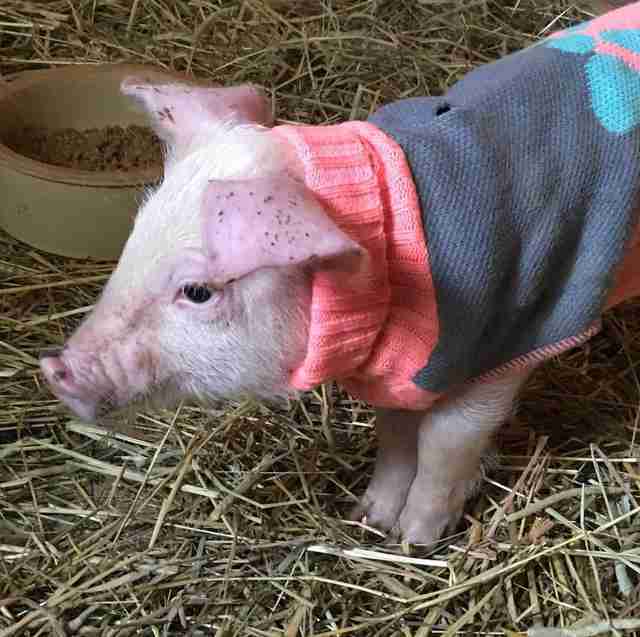 Luckily, he got in touch with Poplar Spring Animal Sanctuary, in Maryland, who was happy to give the little piglet a home. Beam drove straight there, where the sanctuary workers set her up in a comfy dog bed with a blanket. 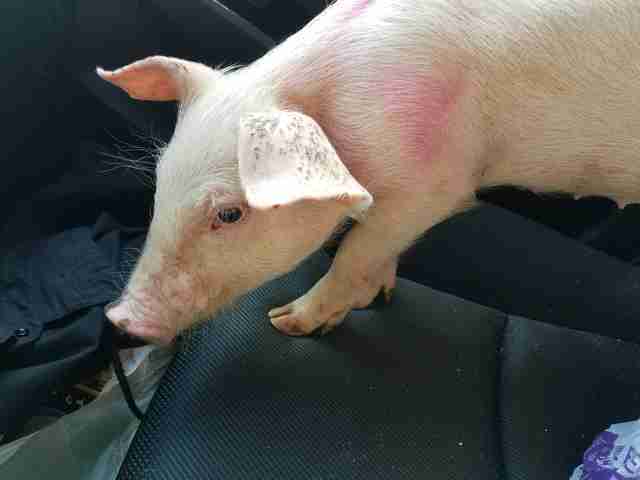 "The piglet was malnourished, but didn't appear to be injured and had a healthy appetite," Beam said. "She startled easily at any sudden movements but didn't mind being petted or held. She even nuzzled and nibbled at my fingers." Beam added that he was surprised at how much like a little puppy she was. "Even as someone well aware that there's very little difference between dog and pig intelligence I was amazed at how exactly like a puppy she was!" Beam said. "How alert and comprehending her eyes looked, and how much personality she had." 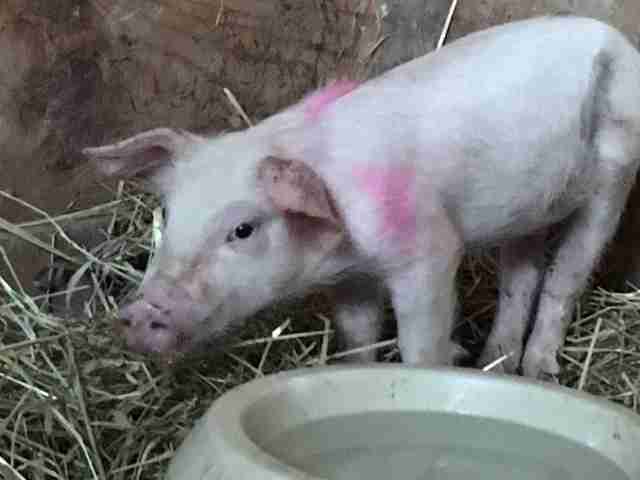 When the little piglet arrived at the sanctuary, Beam learned that she is just about 2 weeks old and was probably on her way to an auction to be sold for eventual slaughter. 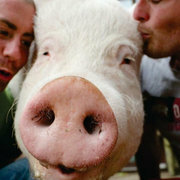 "The people at the sanctuary say she's very lucky," Beam said. "She'll grow up fat and happy." The people at the sanctuary named her Ellie. "She is still exhausted and recovering from her ordeal, so not running and playing yet," Terry Cummings, director of Poplar Spring, told The Dodo. "She is a pretty tough little girl, so I think she will get through this! We are giving her lots of meds and TLC." They also gave her a dog sweater. When asked if he'd ever done anything like this before, Beam said that the closest he'd come was helping lost dogs find their owners. "I guess I'd always hoped I was that kind of guy," he said. "I was lucky that I left the office a little later than I intended," Beam added. You can help Ellie — and the other rescued animals at the sanctuary — grow up strong by making a donation to Poplar Spring.